Join us on Wednesday 11th April at Mojo for a very special Quiz Night, raising funds for the Family Holiday Association!We have a night of daft trivia, testing questions and general silliness lined up, and as always, the emphasis will be on fun, with a little friendly competition thrown in. Everything is explained clearly on the night, so newcomers are especially welcome. 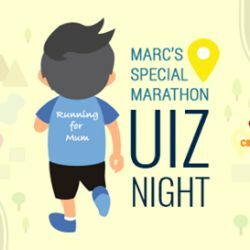 This particular quiz will be held in memory of Marc the Quizmaster`s Mum Sue, who passed away in 2015. All funds raised go to one of her favourite charities; the Family Holiday Association.The quiz takes place at Mojo Club, right in the heart of the Old Town. The prizes will be even bigger than usual, with donations from companies including Dyson, Lacerta Wines, Quest Mission Escape Room, Jerry`s Pizza and much, much more! Plus we have a Snowball Question Jackpot that stands at 2500 Lei!Teams can be no larger than 6 people, and if you have more in your group, we will simply make two or more teams and sit you together. You can book NOW for by emailing quiz@mojomusic.ro. Space is limited and we will sell out, so book quickly!